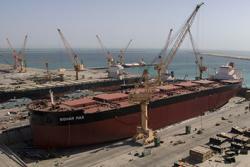 Oman Drydock Company (ODC) welcomed the biggest vessel to enter the dry dock since it opened in 2011. The Sohar Max is one of the largest bulk carriers ever built, measuring 360 metres LOA, 65 metres in beam, with seven cargo holds and a total a capacity of 400,000 tonnes. Solar Max is one of the Valemax fleet of very large ore carriers (VLOC) owned or chartered by the Brazilian mining company Vale S.A. to carry iron ore from Brazil to European and Asian ports. With a maximum loaded draught of between 22 and 23 metres, these ships are limited only to a few deepwater ports in Brazil, Europe and China. Built in 2012 by Jiangsu Rongsheng Heavy Industries in China and originally called Vale Sohar it was the first-ever fully laden Valemax to discharge iron ore at a Chinese port in July 2015. Previously in 2012, the Chinese had imposed a ban on fully laden Valemaxes from berthing at Chinese ports amid supposed environmental concerns. ODC took delivery of the Sohar Max for an 11-day maintenance drydock project for the Oman Shipping Company (OSC) carrier. “Maintenance work on the Sohar Max is now well underway and will be completed to a tight time schedule,” Dr Ahmed Al Abri, Acting ODC CEO said, “It involves complex repair and maintenance work. Key areas of delivery include painting, replacement of consumable parts, repairing defective parts and carrying out other works related to technological aspects”, he stated that “the dry dock is also preparing for another high-profile project with Sohar Max sister-ship, and fellow iron ore giant Liwa Max in the coming months”. “In the last six years we have formed a strong alliance with OSC which is one of the largest shipping companies in the Gulf. The Sohar Max is the latest in a series of successful projects delivered for OSC dating back to 2011. The work will take place in one of the two large graving docks (410m x 95m, 410m x 80m) in Duqm, located 450km south of Mucat. ODC is the largest ship repair yard in the Middle East. It has five quays of 2,800m long with water depth of 9-10metres and five workshops covering outfitting, electrical works, machinery, hulls, blasting and painting and cryogenics. ODC has a total of 1.3 million m2 of land for its operations in Duqm. “In total we received more than 462 vessels since 2011,” he said. “We have developed a robust track record working on a broad range of projects from VLCCs to container vessels, RO-ROs, barges, LNG carriers, LPG carriers, chemical carriers and vehicle carriers. While initially largely focused on repair we are now very much geared up and actively seeking new build and conversion work. This follows successful projects including the Greek-owned Olympic Luck which ODC converted from an Oil Bulk Ore carrier to a Very Large Crude Carrier.